Darwinism misled researchers into developing a harmful set of treatment techniques for certain back conditions. These therapies were based on the idea that humans at one time walked on all fours and that back problems were produced primarily by complications resulting from humans’ newly evolved upright posture. Back problems supposedly exist today because humans now walk upright on vertebrae that originally had evolved to walk quadrupedally. This theory has led to a treatment protocol that now is recognized as often impeding healing, and has caused enormous pain and suffering. Treatment techniques used today are in many ways the opposite of the older, now disproven Darwinism-influenced techniques. 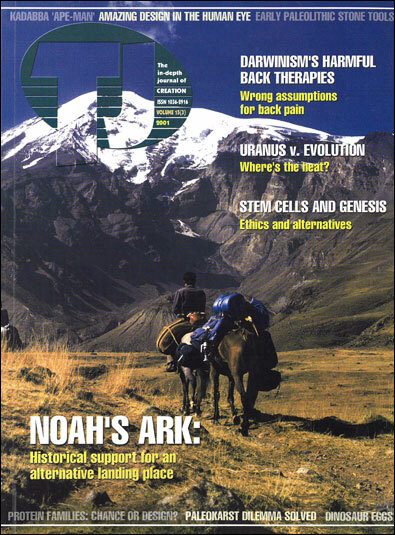 Up to 90% of all Americans suffer at least one debilitating episode of back pain during their lives.1 For decades, evolutionists have taught that the reason for this was the evolution of bipedalism, which was superimposed upon a skeleton previously well-adapted for quadrupedal motion.2,3 In the words of Krogman: ‘Although man stands on two legs, his skeleton was originally designed for four. The result is some ingenious adaptions, not all of them successful.’4 Krogman suggests that when humans started walking upright ‘a terrific mechanical imbalance’ resulted, and when humans began walking on two legs, backaches became common. Krogman also claims that when our prehuman ancestors were walking on all fours, the skeleton was arched like a cantilever bridge with the trunk and abdomen representing the load suspended from the half-circle weight-balanced arch. The main bridge had a jointed, crane-like extension (the neck), and a balance of forces was achieved throughout the system only when walking on all fours. The advantages of this cantilever system were lost when humans started walking upright, Krogman claims, and the backbone was forced to accommodate itself ‘to the new vertical weight-bearing stresses.’ Krogman determines that evolution accomplished this in humans by breaking up the single curved arch of the back into the s-curve we now possess. Krogman adds that we are born with the simple ancestral curved arch (kyphosis), but at the age of four months, when we begin to hold our heads erect, a new backward curve called a lordosis, develops in the neck region of the backbone (the cervical vertebrae). The use of treatment therapies that regain normal lordosis has gradually found acceptance in the world medical community.23 Controlled scientific research has supported the McKenzie approach in comparison with other approaches, including the old evolutionary-based Williams approach.24–29 It is now widely recognized that by teaching patients to maintain lumbar lordosis via use of back support and exercise, pain can be markedly reduced, and that in many cases full healing can occur, even of a herniated disk.30 However, symptoms may be totally or partially removed, but the degenerate ‘aging’ process is not reversed. To maintain a lordotic curve, many authorities now recommend moderate lordotic support by use of a long round pillow called a lumbar roll.31 As a result, many chairs and automobile power seats now have built-in lumbar support systems. Further research has also found that some muscles function for movement, others serve to protect the integrity of joint structures. Richardson et al.34 have found that a major problem often involved in back problems is a breakdown in the small intrinsic muscles of the spine and/or in the manner in which their activity is controlled. They have developed an exercise program to strengthen these muscles, a program that they have experimental evidence is highly effective in treating back pain. The reason for back problems, Williams stressed, is because the sacral area of an infant is curved the wrong way, i.e. backwards, which would be natural if humans walked on all fours (the vertebrae are similarly shaped in animals that walk on all fours). When walking upright, the feet still move forward, but the lower back is shifted upward instead of forward, producing the problematic lumbar hollow in the small of the lower back. If the disk erupts in a child, the jelly-like substance exerts very little pressure on the nerve, and the disk is soon ‘repaired’ by the body. In an adult, the disk continually presses on the nerve, and is ‘repaired’ very slowly or may slowly shrink with time thereby reducing symptoms.38 The tear may heal, but the disk is far from normal. The body cannot put the ‘jelly’ back into the ‘container’ and seal it again to make it perfect. Consequently, and in accordance with Williams’ Darwin-centered theory, one should stay in bed, often for a considerable length of time, in order to allow the naturally defective spine time to ‘repair’ itself. This theory is often repeated by evolutionists in support of the view that humans evolved from ancestors that walked on all fours. The problem is that this theory, although logical from an evolutionary framework, is entirely wrong, which is why its application to solve back problems has produced an enormous amount of harm. It now is recognized that the curvature of the lumbar vertebrae is critically important for back health, and the problems do not result from too much curvature as Williams’ theory states, but from too little curvature. The lordosis helps to prevent disk rupture by subjecting the disk to pressure to keep it in place. This is done by placing the body load directly over the central weight bearing axis through the hip joints, thus minimizing oblique or vertical shearing loads on lumbar disks, but still allowing movement of the spine. Williams provides numerous drawings and illustrations of various ways that one can eliminate the lumbar lordatic curve. He even recommends a sitting position that normally should be assumed, a posture commonly called ‘slumping.’ This and many of the other postures he recommends are the opposite of what is recommended today (and some of the positions and therapies he recommends are now widely recognized as the cause of back problems). Williams also claimed that ‘lying flat on the back also increases low back pain in many individuals.’42 Today, the recommendation is to sleep on one’s back. The fact that weight lifters routinely lift hundreds of kilograms without incident because they are in good physical shape also belies many of the assumptions behind the Williams argument. It also supports the conclusion that the reason back pain occurs in most cases is due to improper lifting, lack of exercise, inflammation, and/or weak back and abdominal muscles.48,49 The deep inner back and abdominal muscles act like the body’s natural corset, supporting and stabilizing the spine to help the disks remain in position, and also equally distributing the weight, which enormously reduces the likelihood of disk protrusion. One major problem of poor human design that Price mentions is back problems.58 And, as pointed out by Woodmorappe,59 dysteleological arguments (attempts by evolutionists to deny the existence of a Designer by calling attention to supposed flaws in living things) are presented to side-step the central issue. In this case, Darwinists try to shift the focus from the real issue, viz., how spine-bearing creatures could have evolved from spineless ones (a position for which no substantive evidence exists), to why our Designer designed a human spine in its current form. What about cases in which a person does exercise properly and otherwise takes care of their back and still suffer back pain? Some evidence exists that a mutation is responsible at least for some forms of back problems, specifically intervertebral disk conditions and sciatica.67 The further we move from the Fall the greater becomes the mutational load and the more likely ‘poor mutations’ for disk strength and longevity become the norm rather than the occasional. The Williams theory is only one of many examples of evolutionary reasoning which, although seemingly convincing (and a reading of Krogman’s article shows that they were very convincing, even to some creationists), are wrong. The late Verna Wright, then co-director of bioengineering at Leeds University, called the claim that upright posture is the culprit for frequent back problems in humans ‘nonsense.’68 The Williams therapeutic approach may be appropriate for certain abnormalities, such as spinal stenosis found in older people. Nevertheless, someone who has experienced back problems usually can detect very quickly that many of the positions Williams recommends are those that cause back problems, and many of the ones he claims are ‘incorrect’ actually can help solve the problem. This misleading theory of back pain causation and treatment has caused untold suffering and possibly permanent damage to millions of people. In many cases, conscientious long-term utilization of the McKenzie approach has been highly effective in alleviating the problem, whereas use of the Williams’ approach was often a total failure. This is only one of many examples where Darwinism has misled research, and has produced conclusions that have resulted in much harm. I wish to thank Melanie Steinke, Bert Thompson, Sara Gilbert, Clifford Lillo, Scott Gilbert, David Demick, and John Woodmorappe for their insights and comments on an earlier draft of this article. Goldmann, D. and Horowitz, D., American College of Physicians Guide to Back Pain, Dorling Kindersley, New York, 2000. Return to text. Gracovetsky, S.A., Function of the spine from an evolutionary perspective; in: Volume 1, The Lumbar Spine, 2nd Edition, W.B. Saunders Company, Philadelphia, pp. 259–269, 1996. Return to text. Krames Communications, Back Owner’s Manual: A Guide to the Care of the Low Back, illustrated by Fran Milner, Krames Communications, Daly City, CA, Sixth Printing, 1986. Return to text. Krogman, W.M., The scars of human evolution, Scientific American 185(6):54–57, 1951; p. 54. Return to text. Tuttle, R. (Ed. ), The Functional and Evolutionary Biology of Primates, Aldine Atherton, Chicago, 1972. Return to text. Smail, R., Oh, my aching back! Creation 12(4):20–21, 1990; p. 20. Return to text. Ratcliff, J.D., Your Body and How it Works, Delacorte Press, New York, pp. 227–228, 1975. Return to text. Williams, P.C., The Lumbosacral Spine; Emphasizing Conservative Management, McGraw-Hill Book Company, New York, 1965. Return to text. Ishmael, W.K. and Shorbe, H.B., Care of the Back, J.B. Lippincott Company, Philadelphia, 1960. Return to text. Mooney, V., Introduction to McKenzie, Ref. 31. Return to text. Smail, Ref. 6, p. 20. Return to text. Berger, E., Late postoperative results in 1,000 work related lumbar spine conditions, Surgical Neurology 54(2):101–106, 2000. Return to text. McKenzie, R., Mechanical Diagnosis and Therapy for Low Back Pain: Toward a Better Understanding, Spinal Publications, Waikanae, New Zealand, Saunders, Philadelphia, 2nd Edition, 1996. Return to text. Jacob, G. and McKenzie, R., Spinal therapeutics based on responses to loading; in: Liebenson, C. (Ed. ), Rehabilitation of the Spine: A Practitioner’s Manual, Williams and Wilkins Baltimore, chapter 12, 1996. Return to text. McKenzie, R. and Kubey, C., 7 Steps to a Pain-Free Life: How to Rapidly Relieve Back and Neck Pain Using the McKenzie Method, Dutton, New York, 2000. Return to text. McKenzie, R. The Cervical and Thoracic Spine: Mechanical Diagnosis and Therapy, Spinal Publications Ltd., Waikanae, New Zealand, 1990. Return to text. Clements, H., What to do about a ‘Bad Back’ and Disc Trouble, W. Foulsham & Co. Ltd., London, 1968. Return to text. Sobel, D. and Klein, A., Backache, What Exercises Work, Barnes and Noble, New York, p. 136, 2000. Return to text. Sobel and Klein, Ref. 18, pp. vii-viii. Return to text. Baptist Medical System Back School Handout, p. 3, 1998. Return to text. Shuman, D. and Staab, G., Your Aching Back and what You can do about It, Gramercy Publishing Company, New York, p. 12, 1960. Return to text. Shuman and Staab, Ref. 21, pp. 13, 28. Return to text. Murtagh, J., Kenna, C. and Sorrell, C., Back Pain and Spinal Manipulation: A Practical Guide, Butterworth-Heinemann, Oxford, 2nd Edition, 1997. Return to text. Razmjou, H., Kramer, J.F. and Yamada, R., Intertester reliability of the McKenzie evaluation in assessing patients with mechanical low-back pain, J. Orthopaedic and Sports Physical Therapy 30(7):368–383; discussion pp. 384–389, 2000. Return to text. Delaney, P.M. and Hubka, M.J., The diagnostic utility of McKenzie clinical assessment for lower back pain, J. Manipulative and Physiological Therapeutics 22(9):628–630, 1999. Return to text. Foster, N.E., Thompson, K.A., Baxter, G.D. and Allen, J.M., Management of nonspecific low back pain by physiotherapists in Britain and Ireland. A descriptive questionnaire of current clinical practice, Spine 24(13):1332–1342, 1999. Return to text. Samanta, A. and Beardsley, J., Low back pain: which is the best way forward? British Medical J. 318:1122–1123, 1999. Return to text. Gillan, M.G., Ross, J.C., McLean, I.P., and Porter, R.W., The natural history of trunk list, its associated disability and the influence of McKenzie management, European Spine J. 7(6):480–483, 1998. Return to text. Stankovic, R. and Hohnell, O., Conservative treatment of acute low back pain. A 5-year follow-up study of two methods of treatment, Spine 20(4):469–472, 1995. Return to text. Nelson, B.W., Carpenter, D.M., Dreisinger, T.E., Mitchel, M., Kelly, C.E. and Wegner, J.A., Can spinal surgery be prevented by aggressive strengthening exercises? A prospective study of cervical and lumbar patients, Archives of Physical Medicine and Rehabilitation 80(1):20–25, 1999. Return to text. McKenzie, R., Treat Your Own Back, Spinal Publications, 4th Edition, Waikanae, New Zealand, 1988. Return to text. Yost, G. (Ed. ), American Family Health Institute: Back Problems, Springhouse Corporation, Springhouse, p. 4, 1986. Return to text. Baptist Medical System, Ref. 20, p. 38. Return to text. Richardson, C., Jull, G., Hodges, P., and Hides, J., foreward by Manohar M. Panjabi, Therapeutic Exercise for Spinal Segmental Stabilization in Low Back Pain: Scientific Bases and Clinical Approach, Churchill Livingstone, Edinburgh, Philadelphia, p. 4, 1999. Return to text. Williams, P.C., Low Back and Neck Pain: Causes and Conservative Treatment, Charles C. Thomas, Springfield, IL, p. 13, 1982 Edition. Return to text. Osti, O.L. and Moore, R.J., Biochemistry and histology of the intervertebral disc: animal models of disc degeneration; in: Volume 1, The Lumbar Spine, 2nd Edition, W.B. Saunders Company, Philadelphia, pp. 281–306, 1996. Return to text. Williams, Ref. 35, p. 17. Return to text. Urban, J., Biochemistry. Disc biochemistry in relation to function; in: Volume 1, The Lumbar Spine, 2nd Edition, W.B. Saunders Company, Philadelphia, pp. 271–281, 1996. Return to text. Williams, Ref. 35, p. 18. Return to text. Williams, Ref. 35, p. 20. Return to text. Williams, Ref. 35, p. 22. Return to text. Williams, Ref. 35, pp. 30, 35. Return to text. Williams, Ref. 35, p. 47. Return to text. Harvey, J. and Tanner, S., Low back pain in young athletes. A practical approach, Sports Medicine 12(6):394–406, 1991. Return to text. Hernandez, C.A., The current treatment and spontaneous recovery of the herniated disk, Anales De La Real Academia Nacional De Medicina 108(1):227–244, 1991. Return to text. Murphy, R.W., Nerve roots and spinal nerves in degenerative disk disease, Clinical Orthopaedics and Related Research 129:46–60, 1977. Return to text. Caplan, P.T., Back Trouble: A New Approach to Prevention and Recovery, Triad Publishing Company, Gainesville, p. 66, 1987. Return to text. Dunn, J.E., Johnson, C.L. and Cox, W., Treatment of lumbar disks with Chymopapain, Physical Therapy 56(4):399–402, 1976. Return to text. Gallucci, M., Bozzao, A., Orlandi, B., Manetta, R., Brughitta, G., and Lupattelli, L., Does postcontras MR enhancement in lumbar disk herniation have prognostic value? J. Computer Assisted Tomography 19(1):34–38, 1995. Return to text. Tanner, N.M., On Becoming Human, Cambridge University Press, Cambridge, 1981. Return to text. Campbell, B.G., Human Evolution: An Introduction to Man’s Adaptations, Second Edition, Aldine Publishing Company, Chicago, 1974. Return to text. Cartmill, M., Arboreal adaptations and the origin of the order Primate; in: Tuttle, R. (Ed. ), The Functional and Evolutionary Biology of Primates, Aldine-Atherton, Chicago, Chapter 4, 1972. Return to text. Morgan, E., The Scars of Evolution, Oxford University Press, New York, p. 28, 1994. Return to text. Olshansky, S.J., Larnes B., and Butler, R., If humans were built to last, Scientific American 284(3):52–53, 2001. Return to text. Olshansky et al., Ref. 54, p. 51. Return to text. Price, P.W., Biological Evolution, Saunders College Publishing, Fort Worth, p. 256, 1996. Return to text. Wright, R., The ‘new’ creationism, The Earthling, p. 4, on <slate.msn.com>, 16 April 2001. Return to text. Price, Ref. 56, p. 257. Return to text. Woodmorappe, J. , The panda thumbs its nose at the dysteleological arguments of the atheist Stephen Jay Gould, CEN Tech. J. 13(1):45–48, 1999. Return to text. Dembski, W., The Design Inference, Cambridge University Press, New York, 1998. Return to text. Frendin, J., Funkquist, B., Hansson, K., Lonnemark, M., and Carlsten, J., Diagnostic imaging of foreign body reactions in dogs with diffuse back pain, J. Small Animal Practice 40(6):278–285, 1999. Return to text. Sukhiani, H.R., Parent, J.M., Atilola, M.A.O., and Holmberg, D.L., Intervertebral disk disease in dogs with signs of back pain alone: 25 cases (1986–1993), J. American Veterinary Medical Association 209(7):1275–1279, 1996. Return to text. Gaschen, L., Lang, J. and Haeni, H., Intravertebral disc herniation (Schmorl’s Node) in five dogs, Veterinary Radiology & Ultrasound 36(6):509–516, 1995. Return to text. Ness, M.G., Degenerative lumbosacral stenosis in the dog: a review of 30 cases, J. Small Animal Practice 35(4):185–190, 1994. Return to text. Nakama, S., Taura, Y., Tabaru, H. and Yasuda, M., A retrospective study of ventral fenestration for disk diseases in dogs, J. Veterinary Medical Science 55(5):781–784, 1993. Return to text. Wright, V., How your joints (and other points) challenge evolution, Creation 11(3):32–34, 1989. Return to text. Annunen, S. and 14 others, An allele of COL9A2 associated with intervertebral disc disease, Science 285(5426):409–412, 1999. Return to text. Wright, Ref. 66, p. 34. Return to text.